There are a number of real haunted houses in Utah, but the Brigham Young Farmhouse in Salt Lake City is considered to be one of the most haunted. Located in the historic Mormon district called “Old Deseret Village”, many paranormal events and unexplained phenomenon has been linked to this structure. This building was constructed in the middle of the 1800’s as part of a farm colony of the time. To date, it is believed to be among the most haunted of all the homes in the village. Here, you will learn about the Brigham Young Farmhouse, one of the real haunted houses in Salt Lake City, Utah. The first haunting that appears to occur at this real haunted house is the spirit of Brigham Young himself. 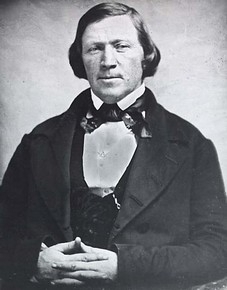 It is believed that Brigham Young loved the house so dearly, that he found it difficult to leave it once he passed from the physical world to the spiritual world. He has been seen in numerous locations of the home. He appears to be relatively old when his apparition is seen. Many have described him as a man in his seventies. He often is seen with a cane, and appears to be relatively friendly. His spirit seems to be an intelligent haunting as he has communicated with individuals in the home. He is believed to have communicated with the woman who restored the home, after taking advice from the spirit…. The “Wilcox” family did a great deal of restoration to the real haunted house, and then elected to give it to the ever-popular Mormon Church. They believed that a celebration was in order, and held a social gathering at the home. They met a young man who was pleasantly dressed in clothing of the period of the late eighteen hundreds. Believed that the man was dressed in this clothing to celebrate the true history of the home, they continued to have a detailed and pleasant conversation with him. Eventually, someone came and took a picture of the three. Later, when the film was developed, the man that the couple was talking to was not in the picture at all – instead, there was just empty space. It is believed that this was possibly the spirit of the past by the name of John Young…. In many instances, there have been documented paranormal experiences in which the sounds of children playing, talking, and laughing can be heard. This is especially true of the room that is appropriately named the “Ballroom”. It is in this room that several social gatherings for the children in the home of the past, as well as their neighboring friends gathered to have parties and play. Today, it appears that the children still linger there, but in a residual type haunting. This basically means that since the children had so much fun in the room, they left a high level of energy behind. Today, the living can still experience this energy…. Take a couple of hours and experience one of the real haunted houses of Utah for yourself!